The American Eagles wing or fullback has adapted well to life at Vicarage Road with Saracens. While he is born in America, he grew up in England and learnt his rugby at Nottingham University. He has captained the American Sevens team and has played in two rugby World Cups for USA. he is one of the most consistent performers in the Premiership and has displayed his versatility by also featuring at outside centre for Saracens. He quickly adapted to the pace of the Premiership and he signed a permanent deal with the club at the start of the 2009/10, a season that saw him become one of the club's and Premiership's most consistent performers. In January 2018 Wyles announced that he would retire from all forms of the game at the end of the 2017/18 season. 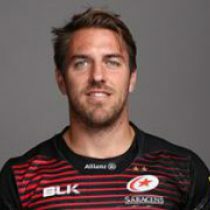 Wyles joined Saracens in 2008 has made 243 appearances for the club scoring 67 tries, helping the club to three Premiership titles and two European Cups. The American has also captained his country making over fifty appearances and featured for his country at the Rio Olympics in 2016.